Entrepreneurs prepared Buffalo to feed the expected multitudes of Exposition visitors with a zeal inspired by dreams of profit. Existing restaurants and lunch counters expanded their capacity and new restaurants sprang up wherever vacant space could be found, especially along the trolley routes to the Exposition grounds. 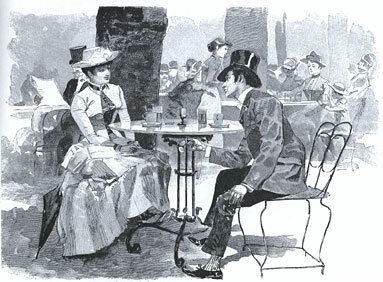 In 1901 there were no health laws to govern these eateries with respect to sanitary food preparationm, and visitors were therefore largely on their own in the selection of places to eat. Most people who roomed in a hotel, boarding house, or private home were able to have breakfast there before heading out to the grounds. Some advertised the cost of breakfast as part of the rate, but others provided the meal, usually for an extra $.25 ($5.11). An example of what might be offered for breakfast, see the letter from a young woman who consumed all that was offered for breakfast at her boarding house. Although noon meals in 1901 were generally referred to as "dinner" because they were the largest meal of the day, lighter versions had also become common and were called lunches. Exposition visitors, wary of stepping on the grounds and paying more than they thought reasonable, were able to purchase lunches packaged to eat later. "The Pan-American Time Saver," the only Exposition guidebook to address the question of eating in detail, said, "Visitors will have little trouble in this part of the city getting good lunches put up in shape to carry on the grounds for 25 cents ($5.11) or less. Some of the large stores on Main Street are advertising a wonderful 15 cent ($3.08) lunch combination. Granose Biscuit and such things are a valuable factor in the problem as they are very nutritious and a great aid to the digestion of other foods." The Elmwood - This is a private boarding house where very satisfactory meals may be had at 50 cents ($10.21) for breakfast or lunch, and 75 cents for dinner. 497 Elmwood Avenue, near Utica Street. Hotel Fenton Restaurant - West Ferry St., close to Main. An excellent regular dinner at 25 cents ($5.11) is served here from 12 o'clock till about 7. Sometimes patrons exhaust the supply before that time. Meals to order at all hours. A very satisfactory breakfast or supper for two people will cost here 25 to 35 cents ($7.15) each. The Potomac - 976 Elmwood Ave., cor. Bidwell Parkway. Breakfast, 35 cts. Lunch or dinner, 50 cts. Seven minutes walk from the Exposition. "717" Elmwood Avenue - near Breckenridge Street. This is a substantial modern place, and we believe will be found quite satisfactory. The Kenilworth - Elmwood Ave., corner of Anderson Place. A high class restaurant in connection with the new "Kenilworth" Hotel, about 800 people taking meals there now. The Delevan Restaurant - 277 West Delevan Avenue, near Grant Street. Breakfast, 6:30 - 9; Lunch, 11:30 to 2; Dinner, 5:30 to 8. Regular meals 35 cents. Order cooking a la cart at proportionate rates. ...at 299 Washington Street is a new restaurant where we have found most satisfactory meals at 25 cents. We also recommend "The Brunswick", 241 Washington Stree, "The Buffalo Dining Hall," corner Court and Franklin Streets, and 13 West Ealge Street for good 25 cent meals. Here is the menu from "The Chapin Place House," opened in 1900 as a lodging place with a restaurant at the corner of Delaware Avenue and Chapin Place in preparation for the Exposition. Close to the Exposition and wherever visitors might pass by around the city there were numerous opportunities to buy sandwiches, beverages, fruit from kiosks and stands. Also making its appearance to many middle class visitors who had never seen one before was the mobile "lunch wagon." 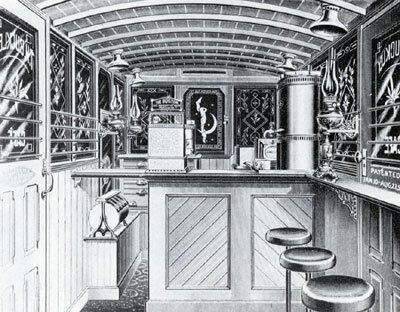 The lunch wagon, invented nearly 30 years earlier, had evolved into a sit-down restaurant (albeit very small) with a stove for preparing eggs, waffles, hamburgers, coffee, sandwiches and pie. 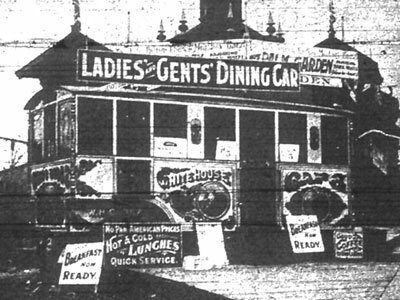 Buffalo saw a very modern representative of the lunch wagon, the "White House Cafe", one of a line developed by Thomas H. Buckley, the "Lunch Wagon King." The exterior was painted white and ornately decorated with historical scenes; the windows were alternating red, white, and blue, etched with images of American Presidents or artistic scenes. Patrons would find inside fine woodwork and brass fittings. Within a decade, the lunch wagon would lose its wheels and begin evolving into the restaurant form known as the diner.